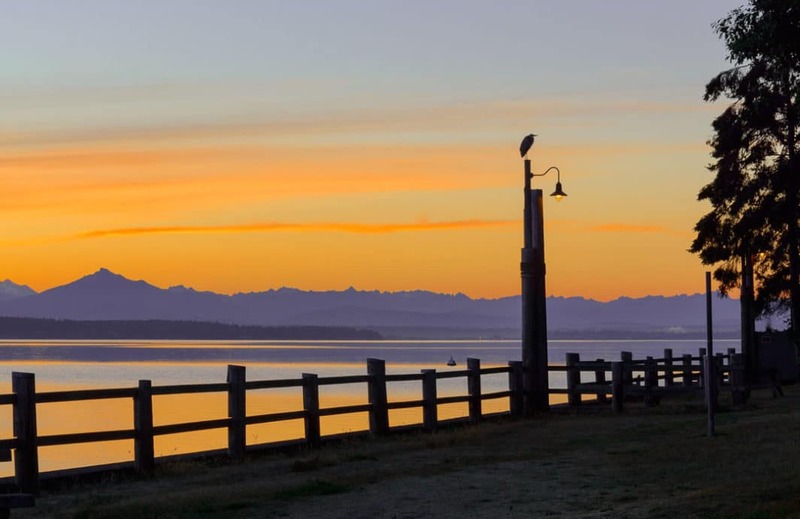 Our Best Beach This Month is Langley’s Seawall Park, an easy-to-reach park that is on the sea side of First Street. It’s a great place to go while walking through downtown Langley. 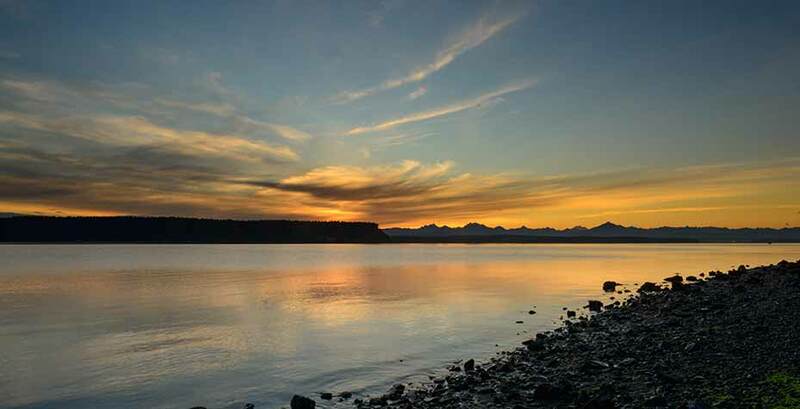 Whidbey and Camano Islands have their own rhythm. There’s the molten glow of glass being blown, bagels boiling, tractors and other farm equipment all over both islands, and a thousand artists prodding and cajoling discordant “stuff” into something that pleases and challenges the human spirit. All set to a background rhythm of nature at work. From the Clinton ferry, take State Route 525 about 2.7 miles north to Langley Road and turn right. Drive 3.3 miles to 6th Street and turn left. Drive one block and turn right on Cascade Ave. Continue straight .3 miles to First St. and turn left. Park on the street and access the beach next to the pizzeria. Seawall Park in Langley was probably the first beach my wife and I explored on Whidbey. It’s a natural place to go when exploring Langley because it’s in the downtown area. This morning, I wanted to see the sun rise. Summer sunrises come long before the island is really awake, so the park and adjoining beach were quiet. Face out to the water at that time of day, and you’d never know there was a town right behind you. The Park parallels Langley’s First Street. It’s a narrow grassy strip with trees and picnic tables; a perfect place for a snack or just to rest after walking Langley’s downtown. It’s atop a seawall that gives the park its name. 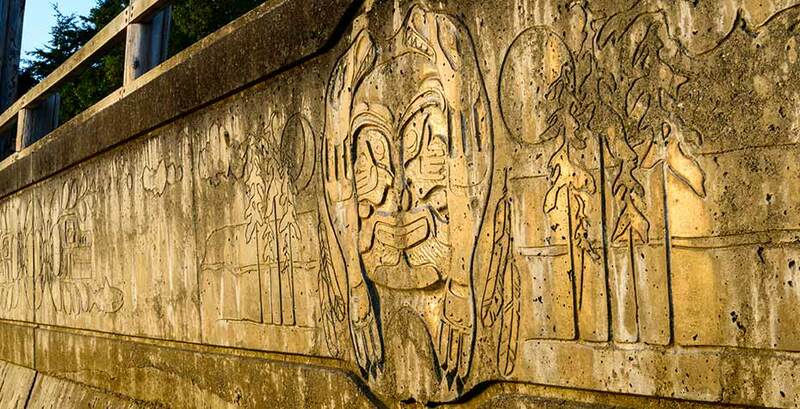 Langley is known for its art and even the seawall is decorated. Waiting for the Earth to turn, I also saw rocks emerge from the water as the morning tide retreated from shore. The waves that wash against our islands are mostly small, so they offer only the gentlest of background noise. So, there they were, three of nature’s rhythms, the day, the tide, and the waves all with their own rhythm, but somehow timed to a single primeval metronome of nature itself.